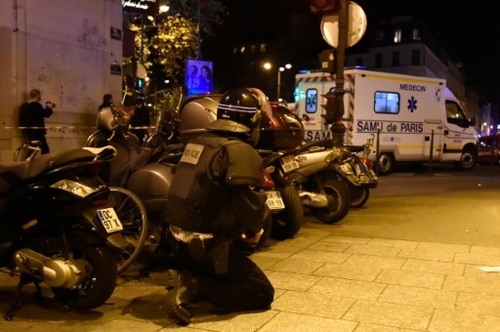 23:57 GMT - United Nations Secretary-General Ban Ki-moon condemns the attacks in Paris that killed at least 39 people and called for any hostages to be immediately released. "The secretary-general condemns the despicable terrorist attacks carried out today in various locations in and around Paris," according to a statement from his spokesman. "The secretary-general extends his deepest condolences to the families of the victims and wishes a speedy recovery to those injured. 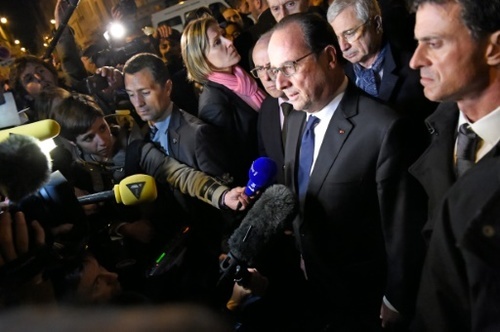 He stands with the government and people of France." 00:00 GMT - Parisians who need somewhere safe to go are using #PorteOuverte on Twitter to find people opening their homes. 00:07 GMT - The Kremlin condemns the "hateful" string of attacks and the "inhuman murders", Russian media reported. President Vladimir Putin meanwhile offered condolences and support to his counterpart Francois Hollande and the French people, according to TASS. 00:09 GMT - Canadian Prime Minister Justin Trudeau expresses solidarity with France after the deadly attacks. "I am shocked and saddened that so many people have been killed and injured in violent attacks in Paris," Trudeau says, offering his condolences in both French and English on Twitter. 00:18 GMT - Around 100 people were killed in an attack on the Bataclan concert venue, police say, and three suspected jihadists were killed when police stormed the venue. 00:28 GMT - "I thought it was just a firework, then my friends told me what was going on in Paris," said a French fan in his 20s at the Stade de France. 00:38 GMT - French President Francois Hollande has cancelled his visit to the G20 summit in Turkey following the attacks, his office says. He will be represented by Foreign Minister Laurent Fabius and Finance Minister Michel Sapin. "We are still currently trying to determine the safety and whereabouts of all our band and crew. Our thoughts are with all of the people involved in this tragic situation." 00:54 GMT - CNN reports that American Airlines canceled one flight from Dallas to Paris and is evaluating others. 00:40 GMT - AFP reporters on the scene say the glamour friendly between France and world champions Germany began as usual in front of a massive crowd of 80,000 when the stands shook. "It's a big firework," said one spectator. "It must be those teams that detonate suspicious packages," commented another fan. But the match went on as normal. Two entrances nearest the explosions were closed off and during the second half news started flowing in on mobile phones, although the size of the attacks was not yet clear. 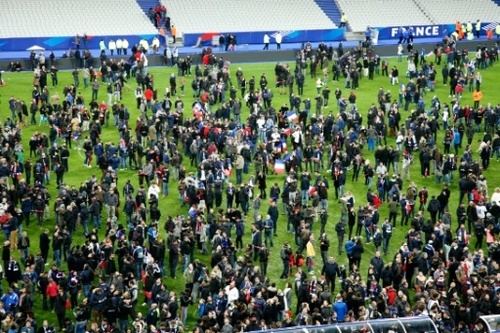 At the end of the match, the organisers simply said that "following an incident outside the stadium" spectators must leave through specific exits. The evacuation was calm and quiet as the gravity of the attacks became clearer. 01:13 GMT - US Secretary of State John Kerry, who has close family ties to France, issues a statement of outrage. 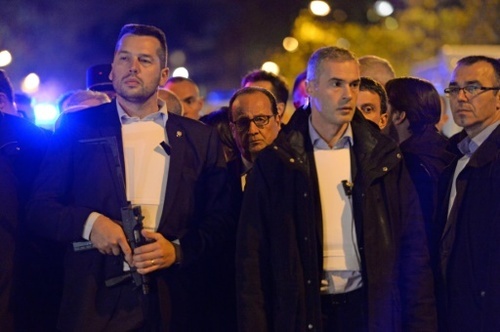 "I share President Obama's outrage and sadness over the terrorist attacks tonight in Paris. "Our thoughts and prayers are with all those affected by this assault on innocent people, going about their lives. And I am deeply concerned by ongoing reports of hostages. "These are heinous, evil, vile acts. Those of us who can must do everything in our power to fight back against what can only be considered an assault on our common humanity." Our embassy in Paris is making every effort to account for the welfare of American citizens in the city, and in the days ahead we stand ready to provide whatever support the French government may require. France is our oldest ally, a friend and a vital partner. We stand with the French people tonight, as our peoples have always stood together in our darkest hours. These terrorist attacks will only deepen our shared resolve. 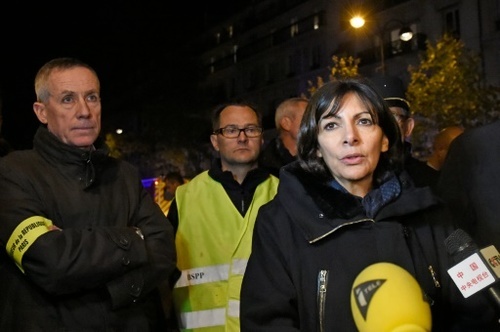 01:14 GMT - Four of the suspected attackers are among the dead, including three who were inside the Bataclan concert hall which was stormed by armed police and another who launched a suicide attack near the Stade de France national stadium. 01:28 GMT - The US State Department asks Americans to notify friends if they are safe. Americans in Paris: If you are safe, be sure to notify friends and loved ones. If you use social media, be sure to update your statuses. 01:28 GMT - The city of Paris is shuttering in the morning. In a tweet, the city announces almost all public spaces will be closed. "Tomorrow city facilities will be closed: schools, museums, libraries, gyms, pools, food markets" says mayor's office. 01:35 GMT - The Belgian authorities said Saturday they have boosted checks on their borders, especially with France, following the attacks in Paris that have left at least 120 people dead. "Reinforced border checks have been established on the borders within the framework especially of a close collaboration with the French authorities," according to Belgium's national centre for threat evaluation, OCAM. 01:50 GMT - One World Trade Center was lit red, white and blue in solidarity with France at the order of New York Governor Andrew Cuomo. Social media is full of old pictures of landmarks lit up or going dark to mark other occasions, but these are from today. 01:51 GMT - "For a moment, we could only see the flames from the gun. We were scared, how did we know he wasn't going to shoot the windows?" a witness said. Another witness, Florence, said she arrived by scooter a minute or so after. "It was surreal, everyone was on the ground. 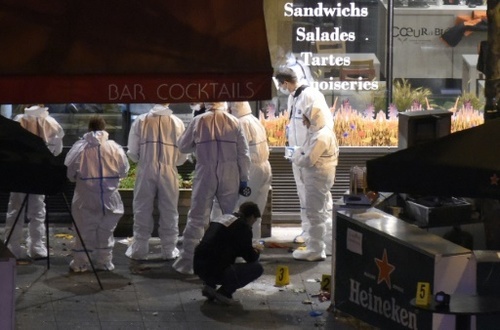 No one was moving inside the Petit Cambodge restaurant and everyone was on the ground in bar Carillon," she said. 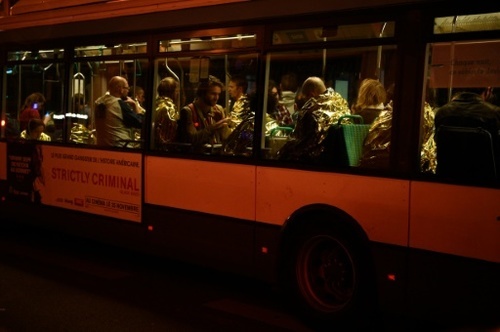 "It was very calm -- people didn't understand what was going on. A young girl was being carried in the arms of a young man. She seemed to be dead." 02:14 GMT - EU foreign policy chief Federica Mogherini tweeted in French that she "is in the process of following with pain and dread the events in Paris." Mogherini, the multi-lingual former Italian foreign minister, added: "Europe is with France and the French people." 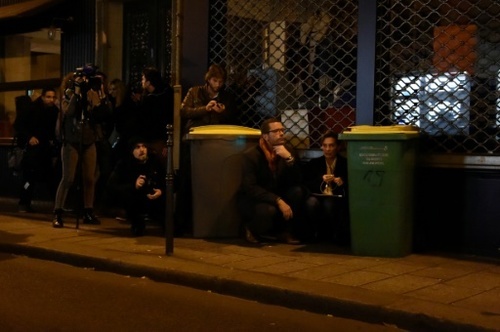 02:17 GMT - AFP reporter Cecile Azzaro says some residents on Rue de Charonne in Paris are offering soldiers coffee from their windows. Some come outside to offer food and drink. A resident on the street was frustrated because he could not enter his building. "I am not a terrorist," he said. "I just want to go home!" 02:28 GMT - The National Basketball Association calls on US arenas to go on heightened alert and enlist law enforcement for intelligence support. 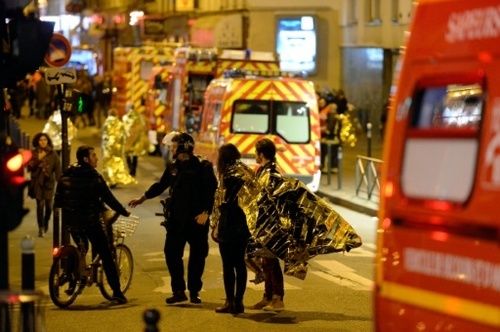 "We do not have reason to believe the events in Paris are related to NBA, however, we cannot be too careful in ensuring we are taking proactive measures," it says in a statement. 02:35 GMT - A French radio reporter who was inside the Bataclan theatre gave a harrowing account of the "10 horrific minutes" when black-clothed gunmen wielding AK-47s entered and fired calmly and randomly at hundreds of screaming concertgoers. 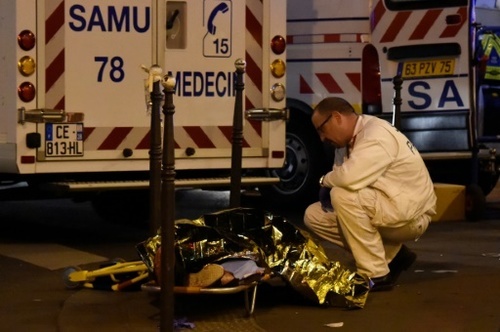 "It was a bloodbath," Julien Pearce, a reporter for France's Europe 1 radio station, told CNN. "People yelled, screamed and everybody lying on the floor, and it lasted for 10 minutes, 10 minutes, 10 horrific minutes where everybody was on the floor covering their head(s)."